Thanks - so same as LHR then? The LGW wiki at the top shows a veggie on each route for long bands, if I am reading that right, on rotation. Just done CE from MAN-LHR-Larnaca and back. Apologies for the lack of photos. MAN-LHR was a breakfast flight. I had tried to request a kosher meal which had defaulted to an Asian Vegetarian for some weird reason. However, when I got on board it turned out that no special meals had been loaded, so it was fruit and yogurt without the bacon roll. A pot of jam was also provided, but there was no bread for it, which made everyone laugh. Not a great initial experience. Fortunately, the rest of the trip was brilliant. I'd ordered VLML to and from Larnaca and received the same dessert (coffee mousse on the outbound and strawberry pavlova on the inboard which is possibly the best dessert I've ever had on a plane) and cheese as the standard meals, with a different starter (caprese salad one way, don't know about the other way as I swapped with someone and had a delicious salmon sashimi) and main course (both pasta dishes, one cheesy, one not - both delicious). The standard mains looked and smelled good and my travelling companions confirmed that they were really tasty. Standard starter on the way back was duck, which also looked delicious. I was genuinely impressed with the presentation, quantity and level of service. The wines could go up in quality a bit, but there was no shortage of bar runs, and Ciroc vodka isn't cheap. 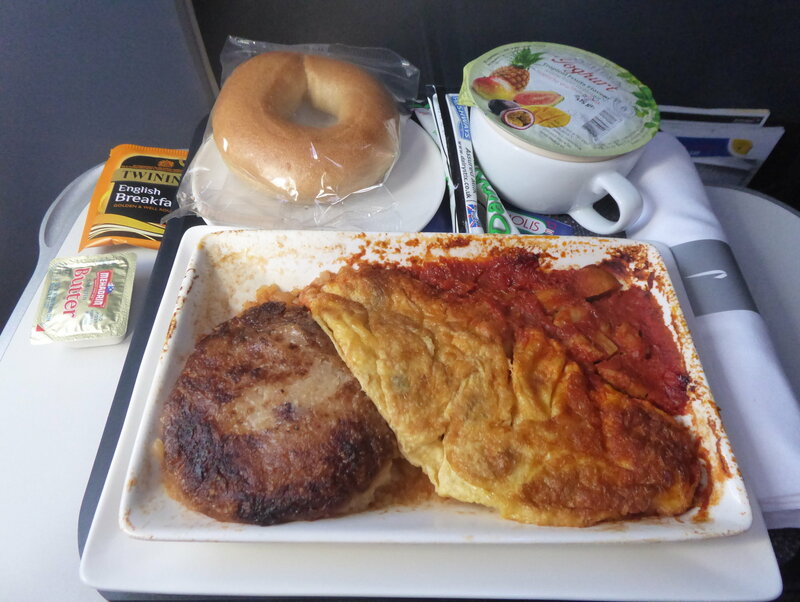 From LHR-MAN it was another breakfast flight and a kosher meal did appear, served on business class china. Biggest plate of exotic fruit I've ever seen on an aeroplane, which was fresh and tasty, alongside two (rather dry) pastries and a big yogurt. The fruit alone was more than enough. Overall a very pleasant experience despite the issues on my outbound domestic segment. Curry for VGML breakfast ex-EDI and ex-HEL on nightstopping flights. Complained to CSM/CSD both times, not what I was expecting at 7 in the morning... AY do a delicious SH VGML hot breakfast (with a tofu-like omelette thing), so I don't see how it can be hard to get this right. I had this recently as an AVML (oddly minus the tomatoes...) and thought it was pretty tasty, and a far more suitable breakfast than a lot of the other offerings - I can't comment on the main full English, but it looked streets ahead of the regular veggie version. Shows how much personal taste affects one's opinion though. I don't think it was entirely clear that you were on a LGW service, and from what we know LGW have also introduced new menus - different from LHR. There were some photos in post 1696 of the new LGW menu outbound, above but my browser isn't showing them any more. Unfortunately we need a bit more data from LGW travellers to be sure what is out there. I'll see what I can do . Ordered a VLML as can't guarantee that there's a veggie option or fish! re post 1696... my album disappeared, not sure if this was due to recent software updates. I have reloaded but unfortunately inbound LGW rot A menu is cropped whereas in 'My album" it is shown in full ... no idea why. PS Globaliser, I will google and find out the reason why when I have some more time. It seems be back now, maybe it isn't just BA with flakey IT! Good god!, what is it? It looks like something they just scrapped off the road! Potato with mushrooms in egg and someother food!!! Got a couple of CE flights this weekend - do we need pictures of particular special meals? Happy to order them and take pictures. Below are the departure times of the flights and what I have selected so far. Love to see what the kosher meals look like on route sto GLA and I wonder who provides the meales from LUX. Please do order and provide pictures!! I'm pretty sure all CE is catered from London for outbound and return so LHR-LUX kosher gets the same as LUX-LHR.